This deathbed memoir by Dr. Paul H. Johnstone, former senior analyst in the Strategic Weapons Evaluation Group (WSEG) in the Pentagon and a co-author of The Pentagon Papers, provides an authoritative analysis of the implications of nuclear war that remain insurmountable today. Indeed, such research has been kept largely secret, with the intention "not to alarm the public" about what was being cooked up. 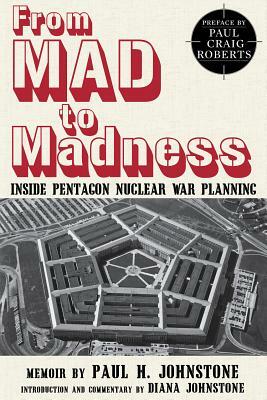 This is the story of how U.S. strategic planners in the 1950s and 1960s worked their way to the conclusion that nuclear war was unthinkable. It drives home these key understandings: - That whichever way you look at it -- and this book shows the many ways analysts tried to skirt the problem -- nuclear war means mutual destruction - That Pentagon planners could accept the possibility of totally destroying another nation, while taking massive destructive losses ourselves, and still conclude that "we would prevail." - That the supposedly "scientific answers" provided to a wide range of unanswerable questions are of highly dubious standing. - That official spheres neglect anything near a comparable effort to understand the "enemy" point of view, rather than to annihilate him, or to use such understanding to make peace. Dr. Johnstone's memoirs of twenty years in the Pentagon tell that story succinctly, coolly and objectively. He largely lets the facts speak for themselves, while commenting on the influence of the Cold War spirit of the times and its influence on decision-makers. Johnstone writes: "Theorizing about nuclear war was a sort of virtuoso exercise in creating an imaginary world wherein all statements must be consistent with each other, but nothing need be consistent with reality because there was no reality to be checked against." The alarming truth today is that these lessons seem to have been forgotten in Washington, just as United States policy has become as hostile to Russia as it was toward the Soviet Union during the Cold War. U.S. foreign policy is pursuing hostile encirclement of two major nuclear powers, Russia and China. Without public debate, apparently without much of any public interest, the United States is preparing to allocate a trillion dollars over the next thirty years to modernize its entire nuclear arsenal. It is as if all that was once understood about the danger of nuclear war has been forgotten.